Fundraisers drive me crazy. I know they help support the schools and the money earned from them goes to great use, but it seems like you have to go through so much to raise those funds. The huge packets filled with information. The never-ending selling to your family, friends and co-workers. The not-so-great prizes for top sellers. The added stress of yet another thing to add to your to-do list. The pick-up of the items and delivering them to the correct person. That is way too much, for way to little...in my opinion, of course. Thank goodness there is Box Tops for Education! 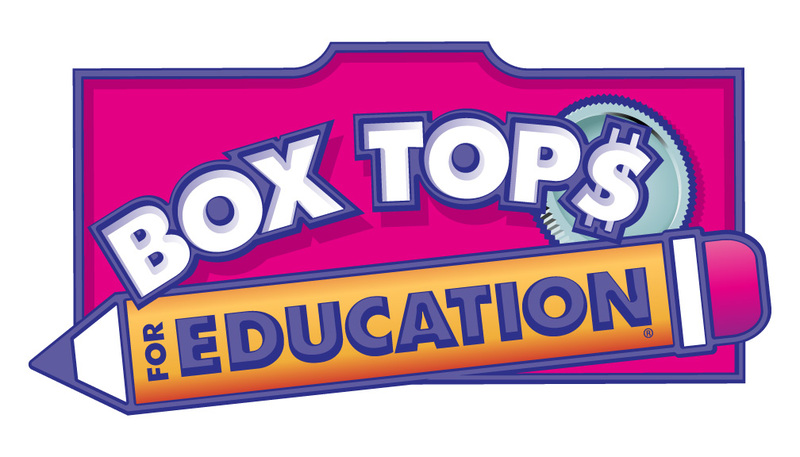 Box Tops for Education®, the nation's largest school fundraising program, announced that it has earned more than half-a-billion dollars for schools across the country since it started in 1996. To celebrate this milestone, this winter, the program is offering a variety of bonus Box Tops on more than 50 million packages at grocery stores and at btfe.com, allowing shoppers to double their earnings with select products. On average, schools in the U.S. earn around $900 annually through the program, but many schools earn more than $20,000 by clipping Box Tops, participating in bonus programs and shopping 300 online eBoxTops® retailers at the Box Tops Marketplace®. 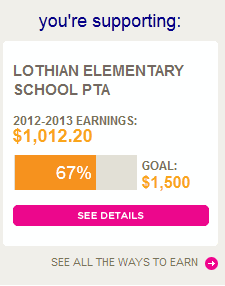 As of today, our school, Lothian Elementary, is more than halfway to reaching our goal. This doesn't include the Box Tops that have not been turned in yet (March 1, 2013 is the deadline to include in totals for this year). There was a little more motivation this year to send in Box Tops. Our coordinator, Donna, decided that she would reward the top earning class with a gift card equivalent to the amount they earned each month. The class would then use the gift card on items or supplies for the class. For example, my son's class won a gift card for the months of October and November. 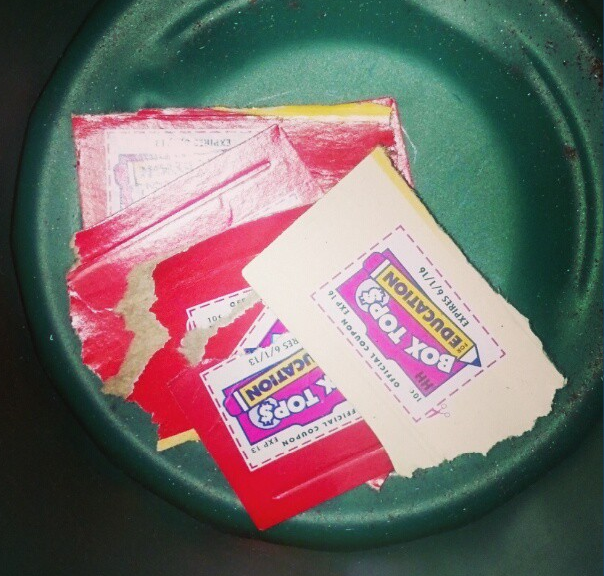 In October, they collected over 400 Box Tops, which is equal to $40. They received a gift card for that amount and decided to use it to purchase more kick balls to use at soccer practice. In November, they collected over 1,000 Box Tops, which earned them a $100 gift card. I'm not sure how they spent this money, but I know it was a nice amount to work with. Collecting Box Tops for Education is one of the simplest ways you can donate and contribute to your child's fundraising efforts. All you have to do is clip the Box Top from one of several participating products and send them into school with your child. You can also visit the website for cool games, sweepstakes, shopping opportunities and other ways to earn. There really is no excuse. Even my grandmother clips Box Tops. She places them in a coffee can so I know just where to go to get them each time. Let's celebrate this great achievement. Box Tops for Education wants to reward you with some goodies for your pantry. Even better, all of the items have a Box Top on them, worth $.10. What a win-win situation. America’s schools have earned more than $525 million through the Box Tops for Education® program since the program started in 1996, including $47 million just since March 2012. More than 90,000 schools use that cash to purchase items such as computers, library books, art supplies and playground equipment. Schools can earn up to $20,000 by clipping Box Tops coupons from 240 products and can earn eBoxTops by shopping online through the Box Tops Marketplace. To learn more and for a list of participating products, visit www.btfe.com. Information, products and promotional items have been provided by General Mills and Box Tops for Education and its program partners. I am also a member of the Box Tops for Education Blogger Panel. Opinions and views are my own.